Darwin NT Australia - a ufo hot spot? 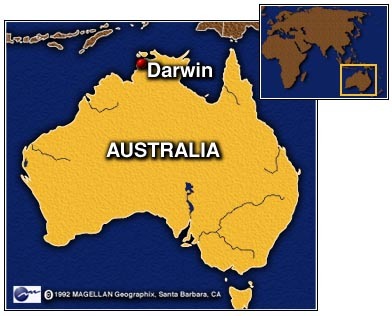 Is Darwin in the Northern Territory of Australia really a Ufo hotspot? RealUfos would like to hear from people in Darwin Australia - Have you seen a Ufo? Please respond to the post if you have and can tell us more. The Northern Territory News revealed yesterday UFO spotter Erik Black, of Brisbane, had spotted an "ominous hamburger-shaped light" at Humpty Doo. The sighting - after a tip-off from Top End UFO-ologist Alan Ferguson - ended Mr Black's 30-year search for a UFO. He said he was already looking into booking flights back to Darwin. "Humpty Doo is the place where I saw my first UFO after so many years of searching - of course I'll come back, it's all happening here," he said. Yep! he's right there!...can't all be crazy!...I hope!?? Ufos that mimic planes - the advent of 'mime Ufos' - fake planes ? Sun has caused earths atmosphere to shrink ! South American Broadcast captures alien?